Solitude is the capital city of Skyrim and is located in the Haafingar hold, which occupies the northwest corner of the province of Skyrim. It is loyal to the Imperial Legion, and as such, is where General Tullius has setup headquarters in Castle Dour. Castle Dour is a large fortress and home of the Emperor of Skyrim. Since Solitude is the capital of Skyrim, it was here where High King Torygg was killed at the hands of Ulfric Stormcloak, the leader of the Stormcloaks. The High King’s death, however, remains a mystery as conflicting accounts can be heard throughout Skyrim. Ulfric was outspoken about his desire for Skyrim’s independence from the Empire. High King Torygg, while realizing it was treasonous to think about such matters, had kept an open mind about the subject. The High King had thought Ulfric was coming to see him to discuss his opinions regarding independence, but unfortunately, Ulfric went to Solitude to challenge High King Torygg. At this point the story changes, depending on who is telling it. According to Ulfric, he challenged Torygg for the right to be High King, and then used the thu’um to send the High King to the ground. After the High King was laying on the ground, Ulfric dispatched him with his sword. Many say that Ulfric “shouted him to pieces” or “ripped him asunder”, which has many in the Empire and the Jarls viewing High King Torygg’s death as murder rather than an honorable duel. View of Solitude’s main street. 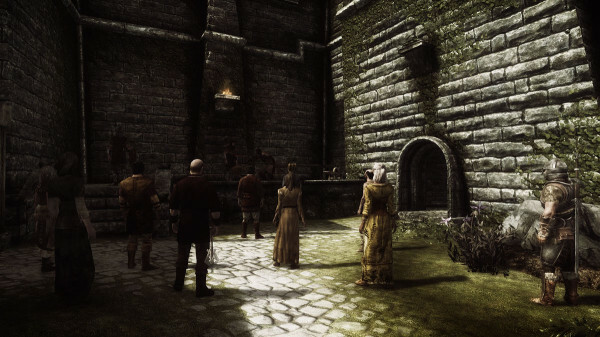 Avingard’s father viewed Torygg’s death as murder, and has requested Avingard join the Imperial Legion and the Civil War against Ulfric and the Stormcloaks. “Avenging the death of the High King by killing Ulfric is the only solution to what happened,” his father once said. Now Avingard has arrived in Solitude to fulfill the promise he made to his father. As he walked through the gate of Solitude he was greeted with a scene he has never seen before in his life. A large crowed had gathered in the city square just inside the walls to the city to witness an execution of one of their own. Avingard stops at the back of the crowd to determine what is about the transpire. Far in front of him was a platform, with a man in an Imperial uniform, a Nord, with his hands bound in front of him, and another man with a large axe were standing. “Positions,” the man in an Imperial uniform on the platform in front of the crowd called out. “Svari, you need to go home,” the large man talking to girl quickly ordered. “Go home and stay there until your mother comes.” The girl reluctantly turned and walked away. “You’re all heart, Vivienne,” the man replied. The crowd had been anxious for the execution to take place, and some were showing their displeasure through their words. “Get on with it,” someone yelled. “You betrayed us!” yelled another. Suddenly, the crowd noise became quiet as the man in the Imperial uniform walked closer to the man on with his hands bound. “Traitor!” someone from the crowd yelled. “Booo!” came the replies from the crowd. “On this day…I go to Sovngarde,” Roggvir said softly resigning to his fate. At that moment, the man in the uniform pushed Roggvir to his knees and placed his head on a block, that had blood stains from previous executions. He then nodded his head to the large man with the axe, who raised the axe over his head. Within one swift stroke, the axe came down on the back of Roggvir’s neck, dislodging his head from his body. “Some gate guard you were!” a woman in the crowd scolded the dead prisoner. With the execution finished, the crowed began to disperse back to the daily chores. Avingard stood and watched for a few minutes, and then left the square and walked down the main street in the city. As Avingard walked by shops that surrounded him on all sides, he couldn’t help but think about the punishment handed down to Roggvir. He wasn’t used to such executions, but in Skyrim such punishment was common for such crimes, especially those thought of as treasonous. While there is still questions surrounding the death of High King Torygg, the Empire sees it as murder and wil punish those involved severely. 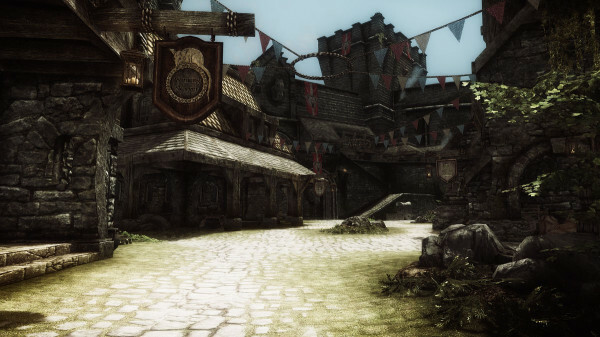 As Avingard continued to walk down the street, the shops and taverns gave way to homes for the citizens of Solitude. Down the street to his right Avingard could see the grandest of all homes – the Blue Palace. This massive building is currently home to Jarl Elisif the Fair, who is the widow of High King Torygg. With the Imperial Legion using Castle Dour as their headquarters, the High King now occupies the Blue Palace. To his left is another massive building, or fortress – Castle Dour. The castle is perched above the city of Solitude in the northwest corner. There is a stone staircase leading up to the large entrance to the courtyard of the castle. 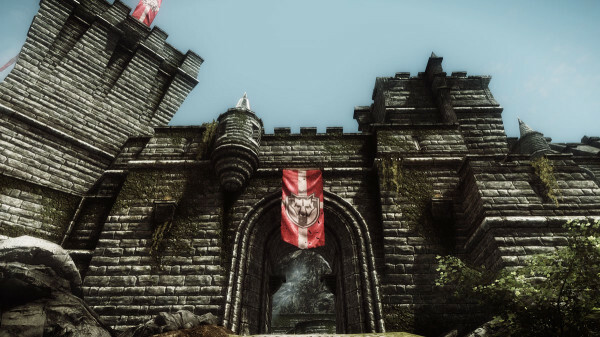 Imperial Legion banners are draped down along the walls of the castle, one on the left battlements high in the air, while a larger one hangs over the doorway. Finding the building to be very intimidating, Avingard makes his way up the steps and into the large, open air courtyard. A large fire pit, with a raging fire, takes up a good portion of the middle of the courtyard. Beyond the fire, Avingard sees targets used by archers to hone their skills. A large staircase rises to the castle walls behind the targets, while a large door to the left provides entry into Castle Dour. On either side of the door, two Imperial solders are dutifully standing guard. Thinking that this was here he had to go, Avingard approaches the door. The two guards look over Avingard, realizing he doesn’t seem to be a threat, they allow him to enter the large castle.